The health care industry is rapidly expanding and requires the use of many different employees. Entry level positions are available in hospitals, and these positions perform a wide variety of duties. Some require post-secondary education, however, most simply require a high school diploma and the ability to learn a very specialized skill. Nursing aides or certified nursing assistants perform routine tasks and hands-on care for patients under the direction of nurses and doctors. They often help patients get in and out of bed, move equipment and bathe the patients. Education for nursing aides is far less than their registered nurse counterparts, and typically require 75 hours of approved training. They must also pass a competency test. Equipment technicians move medical equipment around throughout the hospital. They make sure equipment is in compliance with necessary medical standards and perform daily maintenance on all equipment. Typically a high school diploma or GED is required, and training can be learned on the job. Knowledge of computer systems is essential as most hospital equipment is computerized. Cleanliness at a hospital is crucial. The health of the patients and employees require that the hospital be sanitary at all times. Thus, hospitals employ the use of several custodians to clean and maintain the premises. Becoming a custodian does not require training and those without a high school diploma can receive employment in this arena. Medical assistants are employed through two different types in hospitals, administrative and clinical. Administrative medical assistants often greet patients, answer telephones, schedule appointments and process insurance forms for patients. 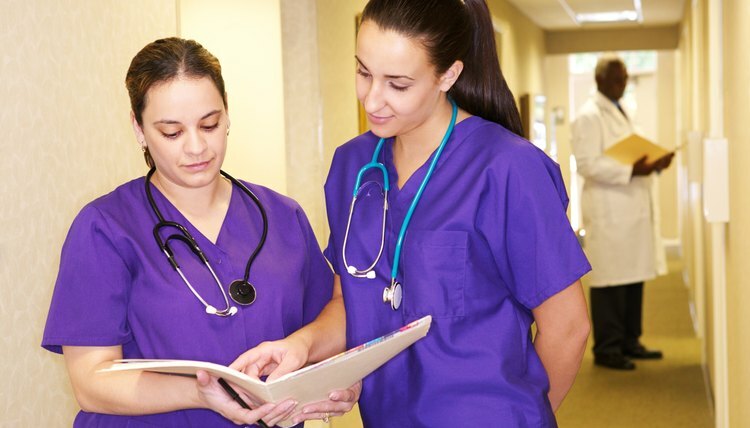 Clinical medical assistants' duties often vary depending on the state, however, they usually record patients' medical histories, record vital signs and may assist doctors during an examination. While administrative assistant positions may just require a high school diploma, most medical assistants must complete a two year program. Post-secondary courses are needed for those working in medical records. However, a medical records analyst may simply possess a high school diploma. Analysts receive medical records, organize them for further processing, and file them so that they can easily be retrieved. This is considered an entry-level position, but does require extreme confidentiality and some knowledge of medical terminology. MacKenzie, Matthew. "Entry Level Hospital Jobs." , https://careertrend.com/about-5375351-entry-level-hospital-jobs.html. 05 July 2017.